A couple walks with their daughter after checking on their flooded home in the aftermath of Hurricane Florence in Spring Lake, N.C., Monday, Sept. 17, 2018. The storm system that struck southeastern states along the U.S. East Coast as Hurricane Florence is now soaking areas in the northeast with heavy rain as forecasters warn of widespread flooding threats. Flash flood watches and warnings are posted from Virginia into Vermont and New Hampshire through Tuesday. ​Those accompany the flooding in North Carolina, where Florence hit as a Category 1 hurricane last week and dropped up to 90 centimeters of rain as it lingered for several days. North Carolina Governor Roy Cooper said Monday many roads remained impassable in the hardest-hit areas in the eastern part of the state, and he called on people to avoid going out if they do not have to as emergency crews do their work. 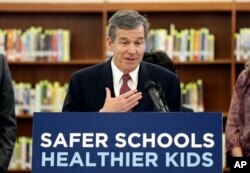 North Carolina Gov. Roy Cooper, pictured in Hillsborough, N.C., in April 2018, declared a state of emergency Sept. 7, 2018. "We've been preparing for and living through Hurricane Florence for more than a week now, but this remains a significant disaster that affects much of our state. 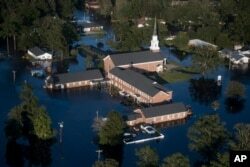 The next few days will be long ones as the flooding continues," Cooper said. Florence is now what forecasters call a post-tropical cyclone, with top sustained winds of 35 kilometers per hour. Several tornadoes damaged buildings in the Richmond, Virginia, area Monday afternoon, killing at least one person. At least 32 deaths are blamed on the storm, the majority in North Carolina. Hundreds of thousands of homes remained without power on Monday. Floodwaters inundate a church after Hurricane Florence struck the Carolinas Monday, Sept. 17, 2018, in Conway, S.C.
President Donald Trump praised the recovery effort, saying the federal government using every relevant resource, including sending nearly 20,000 personnel to help. "Our administration is in constant contact with local and state authorities and we will not rest until that job is done and done perfectly," he said. Trump plans to visit areas hit by Hurricane Florence in the coming days, but the White House says that will only happen after it is determined his arrival will not disrupt the rescue and recovery efforts.